What, just because the Octagon’s brief hiatus ends in China makes you think there aren’t gambling lines available for the fights? Of course there are. “UFC on FUEL TV: Franklin vs. Le” jumps off bright and early Saturday morning, so make sure to place your bets in time. The curtain is drawn on the first preliminary bout at 7:40AM ET/4:40AM PT. 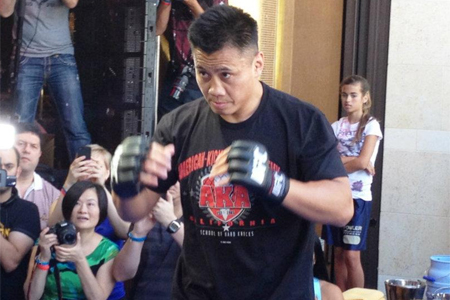 A middleweight matchup between Cung Le (Pictured) and Rich Franklin headlines the freebie fight card. Franklin checks in as a 3.5-to-1 odds-on favorite to post his second consecutive victory. Le, on the other hand, is pegged as a 2.5-to-1 underdog against the former 185-pound champion. CotaiArena inside The Venetian Macau Resort in Macau hosts the festivities.